These Esmeralda grips are fashioned out of a rare black-and-white ebony from Southeast Asia. Like many 1911 devotees, I've used Wilson Combat's legendary 47D magazines forever. I've never found them lacking but have heard from some pretty serious users that they wish they were just a bit tougher. Wilson's new Elite Tactical Magazines were designed to address that concern, as well as make a few minor improvements to the classic 47D. I've actually had a dozen of the new magazines for six months or so, but I wanted to test them thoroughly before I reviewed them here. Unlike other magazines, which are basically seven-round mags reconfigured to hold eight rounds, the new ETM was designed from the ground up to hold eight. The tube is constructed from a high-grade, stainless steel and finished to a high polish to ensure smooth, reliable feeding. The slightly thicker, stronger steel resists feed lip cracking and tube spread, ensuring a longer service life. The magazine tube has observation ports numbered two through eight so you can see your remaining rounds at a glance. To further ensure its structural integrity, the ports are located toward the rear on each side of the magazine body. The other significant improvements were in the ETM's follower and base pad. The follower has an extended skirt to ensure stability and smooth, even feeding. It was also designed to precise dimensions to virtually assure slide lock on an empty magazine. The nylon used for both parts is durable and very slick. The base pad has a slight recess to accommodate the longer magazine body without increasing the overall length of the magazine. Each pad is designed to cushion the blow of even a fully loaded magazine dropped on concrete during rapid reloads. The pads are also numbered one through 10 to aid in identifying specific magazines. The final component, the magazine spring, also got a little attention. Wilson Combat selected a space-age, stainless steel spring wire to ensure the magazine would not take a set when left loaded for extended periods. The extended magazine tube also allowed them to compress the spring even less with a fully loaded magazine, further ensuring reliability by reducing the strain on the spring. Now all that information is great, but anyone can read a press release. 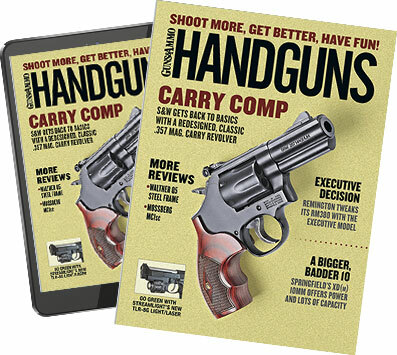 So rather than rushing to write a short review of an untested product, I used a dozen ETM magazines for all my training and 1911 tests over a six-month period. As a long-time Wilson Combat magazine user, I wasn't expecting any problems, but you never know. So I left those magazines fully loaded for every minute of those six months that they were not in use. On the range, I ran thousands of rounds through each one, dropping fully loaded and empty magazines on the concrete over and over again. Through it all, I did not clean them once, yet I never experienced a magazine-related malfunction. After testing them as thoroughly as I could, I would have to say Wilson Combat's Elite Tactical Magazines are as good as they get. If you're in the market for a reliable, durable magazine that won't let you down, I can recommend them without hesitation.